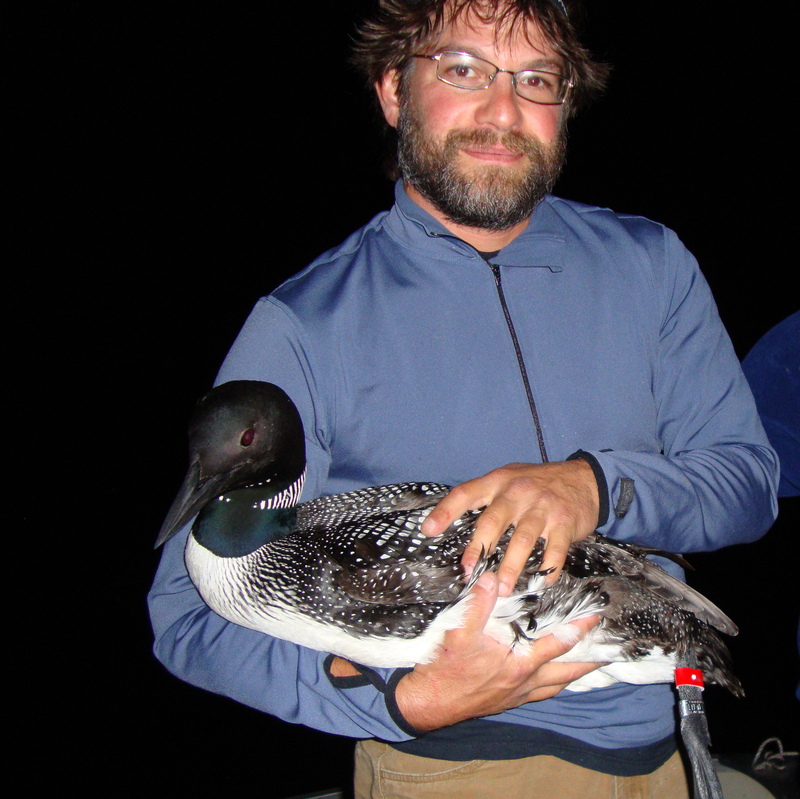 Researcher Joe Kaplan holds Michigan’s oldest banded common loon in 2010. The bird was recently found dead from Avian Botulism on a Lake Michigan Beach. Photos courtesy of The Loon Network. Michigan’s oldest banded loon died last weekend on a Lake Michigan beach, according to Michigan Audubon Society which reported that the 21-year-old loon died from avian botulism. The loon is known as “The Patriarch.” It was born in 1991 to a pair that nested on Clam Lake in Antrim County. It was banded that year and became one of the first common loons banded in Michigan. The work was done by Western Michigan research biologist, Dave Evers. MAS staffers reported this week that The Patriarch spent several of its juvenile years on the Gulf of Mexico before returning to Michigan where it established territory in Antrim County near the mouth of the Intermediate River. It returned there for several years and later moved to the south arm of Bellaire Lake where it mated successfully from 2004 to 2012. The Patriarch was re-captured and re-banded in 2010 by Joe Kaplan, a research biologist with Common Coast Research and Conservation Inc., of Escanaba Michigan. When captured again for study in 2011, it was in good health, according to Kaplan who said it flew more than 42,500 miles during its lifetime of north-south migrations. It produced 16 chicks, of which six have been banded. The Michigan Department of Natural Resources Wildlife Disease Laboratory in Lansing reported that the loon died from Avian Botulism It was found on a Northport beach in Grand Traverse Bay. Botulism is carried in the fatty tissues of some fish that loons eat. Memorial gifts may be sent to the LOON NETWORK, P.O. Box 117, Alden, MI 49612 or donations can be made online at www.commonloon.org. This entry was posted in Uncategorized and tagged Avian Botulism, Birds, Common Loon, Dave Evers, Environment, Joe Kaplan, Lake Michigan, Loons, Michigan Audubon Society, Nature, Northport, The Patriarch, Wildlife. Bookmark the permalink.